You will need to purchase the Timberline body and the right carbide for you chain. The Accessory Angle Guides allow the Timberline sharpener to work in the 25-degree or 35-degree position, and can be swapped in for the 30-degree guides that are standard with the Timberline. Comes in a pair with hex wrench. Remember to get the right bit for your chain! The Timberline Chainsaw Sharpener is a great tool to get professional sharpening results on your saw chain, and keep your saws cutting at peak performance. The Timberline sharpening tool sharpens every tooth evenly, so you get identical height, length, and angle for top cutting results. The Timberline tool is a solid platform for sharpening each tooth with the carbide cutter, which is operated by a hand crank. The key to the tool is a solid platform that won't bend, flex, or otherwise move during sharpening. This acts as a fixed guide to sharpen each cutting tooth accurately on the chain with little or no deviation. Each tooth is sharpened individually with the carbide cutter fitted on a hand crank. An adjustable stop or pawl pushes the chain forward into the carbide cutter and thus sets the length of each cutting tooth. This tool is a great way to increase the performance of your saw and increase safety at the same time. 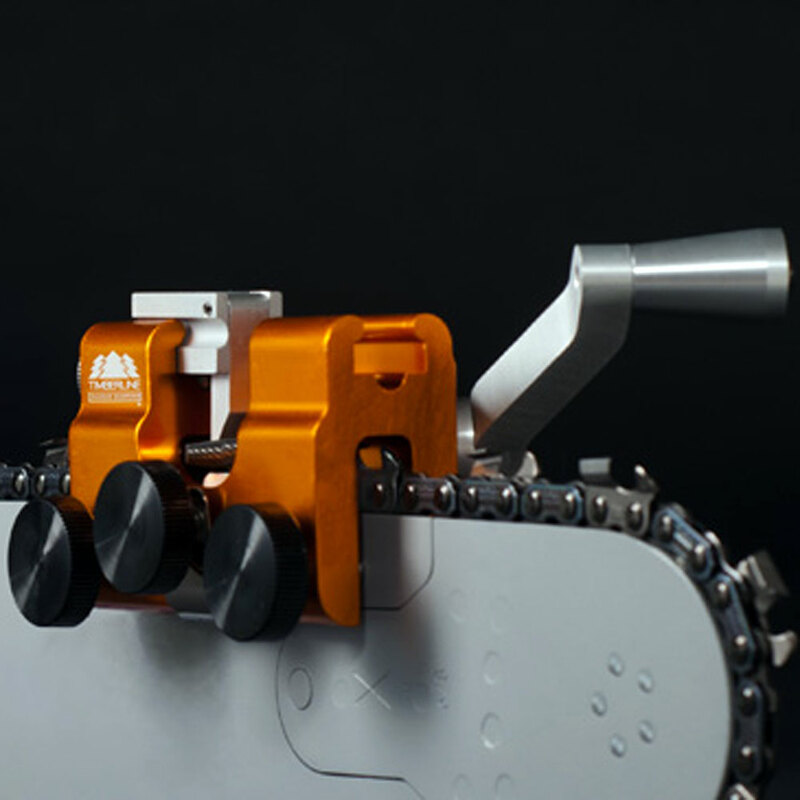 The Timberline Chainsaw Sharpener makes getting sharp chains easy for all levels of users. One sharpener is compatible with all four carbide sizes. The carbide size required is determined by the chain pitch which is usually labeled on the chain saw bar near the motor. This number will be .404, 3/8, .325, or 3/8P. Large 13/64" - also for 3/8" pitch, but slightly smaller. Good for 3/8" Stihl chain. Carbides experience most wear the first time a chain is sharpened. This is due to the carbide not seating properly and binding in the hook of the chain. To avoid this, seat the carbide into the chain by leaving the side knobs loose on the sharpener. Sharpen each tooth of the chain very slightly. You will hear/feel a chatter as the carbide spins which will smooth out as the hook of the chain shapes to the contour of the carbide. This is only necessary the first time a chain is sharpened. Q: How long will the carbide cutter last? A: Carbide cutter lifespan is very much based on the user. However, much testing and customer feedback allows us to confidently claim a minimum of 40+ sharpenings. Users may very well exceed twice that number of sharpenings with careful use by not binding the carbide cutter, by always spinning clockwise, and by following the Instructions and reading our Tips and Tricks. Sharpening multiple old chains with a cutter will also increase wear on the cutter as it is reshaping the teeth to the most efficient cutting hook shape. One of the most common mistakes users make when first using the sharpener is not leveling it correctly on the bar. This will cause the carbide to not fit correctly when sharpening the opposite side teeth. First, as the sharpener rocks on the carbide try to visually level the sharpener flat on the bar and tighten the side screws. Remove carbide, pull chain forward to the next opposite cutting tooth and try to insert carbide in the corresponding guide. If it doesn't fit, loosen the side screw directly across and move the sharpener up or down as needed to allow the carbide to be fully inserted. By sharpening every other tooth you don't have to fully remove the carbide from the guide. This is much faster and allows you to have two free hands to pull the chain forward to the next tooth. If the chain is sharp, but doesn't feel like it is cutting then the depth gauges or rakers need to be lowered. This is the "shark fin" shape directly in front of each cutting tooth. It's purpose is to limit how deep the cutting tooth dives into the wood. As the chain is sharpened not only the length, but also the height is shortened. Eventually these also need to be lowered. Using a flat file, about 2 stokes off the top of each depth gauge is all that is needed. Lowering the depth gauges too much will cause the cutting teeth to take too big of a bite and make the saw jam or worse jump. Uneven cutting teeth is often the cause. If one side of the chain has longer cutting teeth they will take a bigger bite out of the wood than the shorter teeth. If the chain is cutting to the left that means the right teeth on the chain are longer, and vise versa. To correct, sharpen only the side with the longer teeth. If the bar has worn unevenly it will also cause the chain to not cut straight. Depending on the size of chainsaw, it may be required to sharpen all teeth on the right side before switching to the left side. This is due to smaller saws having a thinner bar which shifts the path of the carbide and moves the intersection point off center. To adjust for this offset, simply readjust or loosen the rear thumbscrew so that the chain is sharpened evenly. By first working the right side teeth and then switching to the left the rear thumbscrew should only need to be re adjusted once. “After watching several videos and reading reviews, I purchased a Timberline chain sharpener online from WesSpur June 11,2018 and received it June 12th. I got to try it the next day on my Homelite Super EZ that was really cutting badly. I've always been successful @ sharpening my chains in the past but for some reason cutting has gone from bad to worse recently. I was getting sawdust, forcing the saw and burning my way through whatever I was cutting. It took me a while to set it up the Timberline on the saw but with the videos and following the written instructions I was able to start cutting the saw teeth. I was sceptical that the process would produce any remarkable difference. I went into one of my pastures where I had a downed alder tree trunk that I had been working on for a few weeks. The diameter was about 12 - 15" and my Homelite has a 16" bar. Both my saws weren't hacking it at all, just a lot of hard labor and sawdust. I was about ready to take my saws to a shop to get them sharpened but that would have taken two to three weeks. “Wish I had this 30 years ago. It is rock solid, easy to set up on different saws and chains, and does an impressively accurate, uniform, razor-sharp job. The NiceGuyDave video convinced me to try it - thanks for posting that, it covers pretty much everything you need to know to get started. I am tempted to get a spare crank handle so I can leave both carbides permanently mounted and not have to take any allen wrenches or other small parts out in the woods. I will probably still touch up chains with the file while in the middle of a job but this is my go-to for bringing chains back up to factory sharp. Will be interested to see how long the carbides last.